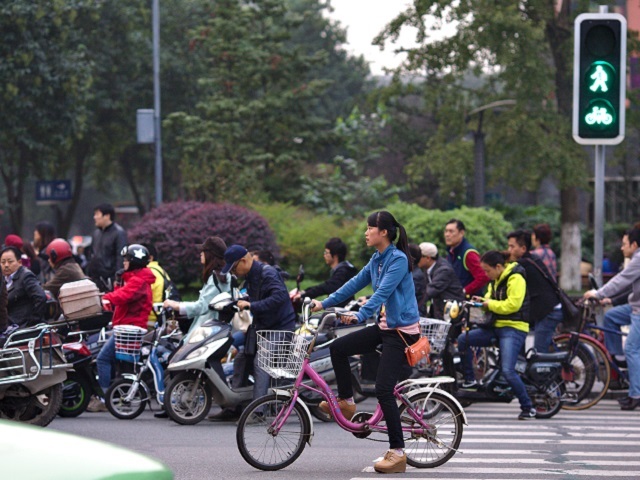 Transitioning from emissions-intensive vehicles to bicycling and other forms of sustainable transport is a priority of China’s new Action Plan for Prevention and Control of Air Pollution. Photo by Maciej Hrynczyszyn/Flickr. This is the second installment of the China’s Clean Air Challenge series, exclusive to TheCityFix. This series examines the increasing social, environmental, and economic impacts of serious air quality issues in Chinese cities, and investigates the source of emissions and sustainable solutions. Toward the end of 2011, episodes of severe pollution levels in China started attracting worldwide attention. Global media employed terms like “airmageddon” and “airpocalypse,” sparking considerable discussion and debate on social media. Nearly four years later, air pollution remains a pressing issue in Chinese cities. Last month, journalist Chain Jing released Under the Dome, an independently produced documentary investigating both the causes and effects of China’s toxic levels of air pollution. Within 48 hours, the video had gone viral, reaching over 100 million views. Although viewers have now been restricted from accessing the 103-minute documentary within China, the impact of the film’s message among Chinese citizens has already been forceful. Air quality has long been a problem in Chinese cities, but it wasn’t until late 2011 when the public started to express significant frustration. Chinese social media platform Weibo has since become a major venue for public discussion. This type of grassroots communication has brought air pollution and its consequences to the center of public consciousness. PM2.5—the air pollutant most associated with respiratory health risks—is now a household phrase. But the problem continued to worsen, and in 2013, PM2.5 in Beijing spiked to 25 times the level considered safe by the World Health Organization. Today, China’s Ministry of Environmental Protection reports that cities across China suffer more than 100 days of extreme haze—when PM2.5 concentrations reach four to five times the acceptable levels—per year. Local governments have responded quickly to inform the public about proper protection responses and implement emergency emissions reductions, but public pressure for further action has never been higher. Even before Under the Dome—and despite its censorship—public awareness of the reality and consequences of living with air pollution has been steadily approaching fever pitch. Public outrage over deteriorating air quality in China did eventually prompt government response. On September 12, 2013, China’s State Council released the Action Plan for Prevention and Control of Air Pollution, setting a road map for air pollution control from 2013-2017 in three key megalopolis regions: Beijing-Tianjin-Hebei, the Yangtze River Delta, and the Pearl River Delta. The Action Plan states that the regions’ annual average concentrations of PM2.5 should be reduced by 25 percent, 20 percent, and 15 percent, respectively. 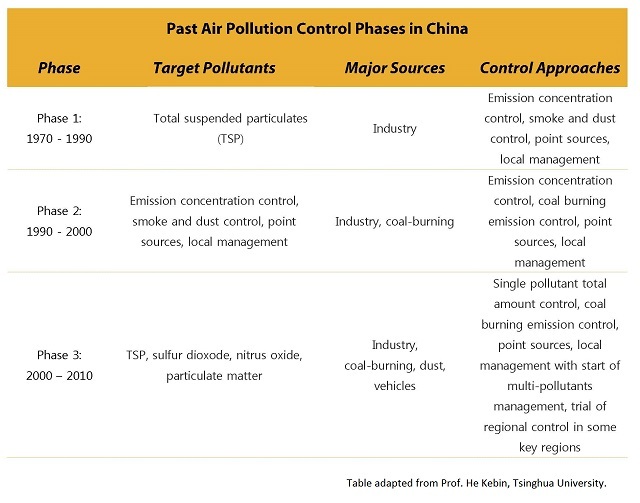 China went through three strategic phases of air pollution control before 2010. Each phase has target pollutants, major emission sources, and control approaches. Table adapted from Prof. He Kebin, Tsinghua University. Click to enlarge. The current combination of regional action plans and national strategies make China’s “war on pollution” a much more robust and far-reaching approach to addressing noxious air pollution. Distributing responsibilities and conducting performance assessments: The central government has assigned 80 tasks to various national ministries and has signed agreements with 31 individual provinces to make sure air quality improvement targets are achieved. Curbing emissions from industrial sources: Six emissions standards have been issued since September 2013, covering variety of industrial and manufacturing industries. Managing vehicle emissions: The central government will strengthen vehicle emissions standards by 2018 and has established a timetable to transition to cleaner sources of fuel. At the local level, older car models will soon be phased out the market. Restructuring economic and energy sectors: One notable example of these efforts is that the Beijing-Tianjin-Hebei region introduced measures to reduce coal consumption. Enhancing air quality management: Several ministries are improving air quality forecasting and scientific research has focused on identifying the sources of pollution. The Ministry of Environmental Protection has issued technical guidelines for developing a comprehensive emissions inventory and assessing energy efficiency that will guide local, on-the-ground work. Whether because of public sentiment, globally influential campaigns like Under the Dome, or the sheer reality of how much air pollution costs China, the government is now taking the issue very seriously. Now is the time for the country’s growing civil society sector to keep engaging key stakeholders for continued action and bring forward sustainable solutions that clean the air and improve quality of life.